As I round on patients on the general medicine ward at Nyapea Hospital with the medical staff, I remain amazed at the challenges they face here. It is not only that their patients have a multitude of medical problems. It is also that there are so many deficiencies. It is here in this place that the healthcare providers are forced to improvise many times throughout each and every day. In July we made a significant investment to Nyapea's laboratory which had been nonfunctional due to lack of reagents. These reagents were purchased and delivered by IMO, and put to use by Nyapea. Even today, although the supply is dwindling, patients continue to benefit. Our goal is to pursue health in as many ways as possible. This is one of those ways: to assist these local health care providers on the front lines in remote facilities with tools by which they are able to better deliver health care as they were trained to do. Written by Todd M. Price MD while on the ground in Nyapea, Uganda in October 2016. In July, representatives from IMO attended the Source of the Nile National Agricultural & Trade Show, an annual exhibition hosted by the Uganda National Farmers Federation (UNFFE) in Jinja, Uganda, to present the compost toilet system as improved sanitation. The show provides local and foreign companies an avenue to present improved technologies in the area of sustainable agriculture. Nene Terence, IMO’s Project Organizer in Uganda, explained to attendees the practice of compost toilets and how it contributes to community sanitation and health. He was accompanied by Oromcon Moses and Jakwonga Wilfred, who are significantly involved in the construction and expansion of compost toilet technology in IMO’s target community of Papoga. For five busy days, they discussed sanitation with farmers, students, businessmen, civil servants, politicians, and teachers - including one interested headmaster in Jinja who oversees a school of 1423 students with no land for much needed latrine construction. These callers have requested IMO intervention for various reasons. Some landscapes prove too rocky for deep pit latrines. Others are too swampy. These difficulties often result in inadequately constructed latrines or open defecation. Even the host of the expo expressed personal interest in the technology. Each year, the number of attendees overwhelms the few toilet facilities at the show ground. In fact, Terence, Moses, and Wilfred had constructed a new wooden compost toilet to use while at the show. To read more about compost toilets and how they influence health, read the report of the compost toilet project in Papoga, Uganda. Meet 13 year-old Ayomirwoth Kevin. She is one of 142 boarded girls at Bethel Junior School in Zeu, Uganda, that have plenty of responsibilities on a day-to-day basis. There are preparations for national exams under pressure of school teachers; general chores like cleaning and gathering water; and some of the older girls serve as custodians to the younger. As a member of the p.7 class, the last level of primary education, Kevin is particularly focused on next year, when she hopes to enter a boarding secondary school and eventually study to be a nurse. But there’s a silent responsibility that Kevin and 70 of her female classmates in the Bethel dormitory must bear in their pursuit of education: personal hygiene and self-care. For many girls, a few missed days each month add up and lead to drop-outs. For the girls at the Bethel dormitories, missing class during menstruation is not an option. That is why Iracan Charity, a midwife at Zeu Health Center, volunteers twice a week at Bethel to discuss with these girls the importance of hygiene and self-care. Only a half-generation ahead and not much taller than many of the 13-year-olds in p.7, Charity serves as a big-sister type to these girls. She creates an avenue for easy discussion. Where the students are often solemn and silent in class, trained by teachers to raise their hands before speaking and to formally stand while providing a recitation or answer to a math problem, discussions with Charity evoke comfort and even laughter. During these talks, she touches on such subjects as sexual education, dignity, menstrual hygiene, and other methods of self-care. In April 2016, Sue Price, IMO’s executive director, began talking with Charity about designing a female hygiene packet that can be distributed to the girls at Bethel. That same week, 12 girls, including Kevin, from the p.7 class were chosen to receive a pilot version of this packet. Inside, they found a washcloth and soap, four reusable pads of various sizes for each stage of menstruation, safety pins, a sealable plastic bag for washing the pads after use, and a 16 fl. oz. water bottle. As long as they are regularly maintained, these bamboo fabric pads should last 3 to 5 years. The idea is that these girls will give feedback to Charity on the hygiene packets, and in months to come the packets can be altered accordingly and distributed more widely to the rest of Bethel and other schools in the parish. With Bethel being the smallest primary school in Papoga parish, there are approximately 1500 enrolled girls at four different primary schools in a parish with no clear source of menstrual hygiene materials. Though Charity meets only with the girls at Bethel, she and Sue have girls throughout the parish in mind as they design this project. Meanwhile, they hope to see an increase in confidence and comfortability in Kevin and her classmates as they focus on their last term of primary education and move forward in better control of their health and hygiene. Over the course of two weeks in April, an IMO team – which consisted of members from the United States, Brazil, and Uganda – converted 24 pit latrines to compost toilets at four primary schools, one nursery school, one agricultural institution, and five homes. After a year of discussion with the community regarding the health and agricultural benefits of a compost toilet, these first 24 toilets represent the pilot of our program to increase health by tackling one of its primary opponents: inadequate sanitation. The current standard of sanitation in Papoga is a pit latrine, which is often uncovered and improperly managed once filled or the infrastructure fails. Not only does an uncovered latrine produce unpleasant smells within school grounds and homesteads, but these pits often contaminate nearby watering sources and allow flies to access human feces and spread it to food, fingers, and faces. The second option in Papoga is open defecation, which leaves human waste and its pathogens exposed to be trampled on by barefoot children. Journalist Rose George, the author of The Big Necessity, states that these sanitation options can lead to humans ingesting up to 10 grams of human waste each day. Each gram can contain up to 10 million viruses, 1 million bacteria, and 100 parasite eggs. It seems evident that these sanitation trends lend to the 74% prevalence of intestinal parasites we found in the children of Papoga in our last Rapid Appraisal. A compost toilet breaks down pathogens in human waste through the use of natural thermophilic bacteria via a composting bin. The pit latrine is replaced by a seated bucket, where human waste and sawdust (or some other internal cover material) is collected over time. The sawdust neutralizes odors and commences the compost process. Once filled, a compost technician empties these buckets into a nearby compost bin, where bacteria, oxygen, carbon-rich material, and moisture break down pathogens within the waste and create organic fertilizer. The following report offers a detailed description of the work undertaken by our team at each school. Four wooden toilets were installed in existing latrine blocks. Three of the four existing stalls contained pit openings. These three were sealed and leveled with cement. Each stall door was reversed to open outwards. The four stalls were then each fitted with a wooden toilet (20-liter). The trench in front of the stalls was filled and leveled with grave and cement. A tippy tap (3-liter) was installed adjacent to the toilet block. Four-bin compost site constructed of wooden shipping pallets. Consists of a four-bin system with each bin measuring approximately 1 meter by 1.5 meters. Compost bins are located adjacent to girls' dormitory. The bins were lined with gravel perimeter to avoid flooding. Bin #1 is covered by one papyrus mat for shade and protection from heavy rain. Five cement toilets installed in previous boy's pit latrine. Four of the five existing stalls contained pit openings. These four were sealed and leveled with cement. Four of the five existing stalls contained a large wooden door that opened inward. These four doors were cut in half, reattached with hinges, and installed to fold at the center. A rod and curtain was installed on the fifth stall (no door previously). A brick and cement toilet (50-liter) was installed into each of the five stalls. A tippy tap (3-liter) was installed adjacent to the path leading to the toilet block. Consists of a four-bin system with each bin measuring approximately 1 meter by 2 meters. Compost bins are located just behind the toilet block. The bins were lined with gravel perimeter. Two wooden toilets installed in existing two-stall pit latrine building. Both bit openings were sealed and leveled with cement. Both doors were reversed to open outwards. Both stalls were fitted with a wooden toilet (20-liter). A tippy tap (3-liter) was installed in front of the toilet block. An exposed pit was covered and sealed its a large stump, rocks, bricks, wood, soil, etc. Compost bins are located near the toilet block adjacent to a perimeter fence. One wooden toilet installed in existing one-stall teachers' pit latrine building. The pit opening was sealed and leveled with wood, soil, clay, and sand. A wooden floor was installed atop the leveled ground. The walls were lined with mud and painted white with a lime-wash. The roof was replaced with new metal sheets and a new timber frame. The building was then fitted with a wooden toilet (20-liter). A tippy tap (3-liter) was installed adjacent to the toilet building. Consists of four-bin system with each bin measuring approximately 1 meter by 1.5 meters. Compost bins are located uphill from the toilet under the shade and protection of a mango tree. Two wooden toilets installed in existing two-stall bathing building. A small window opening in each stall was widened to enhance airflow and access to natural light. Each stall was fitted with a wooden toilet (20-liter). Two cement toilets installed in existing two-stall staff latrine building. Both of the pit openings were sealed and leveled with cement. Both of the doors were reversed to open outwards. A brick and cement toilet (50-liter) was installed into both stalls. Three cement toilets installed in existing three-stall pit latrine building designated for girls. Each of the three pit openings were sealed and leveled with cement. A brick and cement toilet (50-liter) was installed into each of the three stalls. The path in front of the toilet block was lined with gravel. A tippy-tap (3-liter) was installed adjacent to the toilet block. Compost bins are located in between the two toilet blocks, behind a classroom block. The bins are located under the shade and protection of several large trees and smaller coffee trees. Currently, the Ugandan members of the IMO team are on the ground expanding the project into some of the homes surrounding the schools listed above, starting with their own homes. These men act as ambassadors for the project, with an understanding of how to properly manage the new system. They are excited to spread the system to their neighbors and see these neighbors spread it to others. Today marks our 23rd anniversary as an established nonprofit organization in pursuit of better health. That's 23 years of learning and fighting for better health alongside active members of communities worldwide, and we are celebrating today as a milestone on a continuing path of more of the same. On May 17, 1993, Dr. Todd and Sue Price established International Medical Outreach as a 501 (C) 3 nonprofit corporation to organize their efforts towards improved global health. Before that, Todd and Sue would simply fill a suitcase with medication and go to impoverished places to treat patients. Their impact was modest but no small step towards the years to come for them and their mission. Since our establishment in 1993, we have given 60 million doses of medication to children with intestinal parasites and nearly $1 billion worth of medication and equipment to healthcare providers in 37 countries. On our History page, you can read in more detail what these numbers have looked like. In recent years especially, we have moved into program design beyond medication to tackle issues such as lack of clean water, unimproved sanitation, and inadequate health education. Most recently, we launched a pilot program constructing compost toilets in Papoga, Uganda. More updates from this project are forthcoming. Only with the support we've received, from both community members onsite and friends at home over the last 23 years, have we been able to see ideas become reality as we strive to treat and prevent intestinal parasites and other neglected diseases. Here's to another 23! In October 2015, IMO visited Nyapea Hospital, the only level IV hospital accessible to a population of 250,000 in Zombo District and neighboring regions of northwestern DRC. With the specialized expertise of CEO Todd M. Price, M.D., IMO reinforced the hospital stockroom with pharmaceuticals needed for the next 5-6 months. However, the hardworking staff at Nyapea continue to operate in an under-resourced, isolated setting. For more information on our medical programs and how you can help us reach sustainable solutions in Nyapea Hospital and places like it, contact us at info@imoutreach.com or read about our Ongoing Programs. It’s impossible to observe the daily lives of children in Uganda without our presence affecting the mood or routine. However, when we asked 12-year-old Kevin of Papoga how a typical day looks for her, she agreed to show us as accurately as possible. Our day with Kevin resulted in not only a video (shared in the most recent blog post and on our vimeo) but also in a new perspective and motivation for what we do in these communities and how we do it. Every morning, Kevin wakes up in the deep blue of early morning. Like many other 12-year-old girls in Papoga, Uganda, she promptly starts her chores before going to school. She sweeps around the hut she shares with her sisters, gathers water from a nearby spring, and washes a stack of the previous night’s pots and pans. The morning fog still hangs on the eucalyptus and cypress tress as Kevin bathes, puts on her sky-blue uniform, and walks to school down a dirt road. She passes through a vibrant community of early-risers: farmers in the fields, artisans in shops, and other students with books in hand. By the time the African sun warms the red clay soil schoolyard, Kevin greets her friends with a smile and heads inside the tin-roofed, red-brick schoolhouse to resume her studies. Her favorite class, she says, is English. This is where she and her classmates encounter International Medical Outreach. In Kevin’s community, IMO’s intestinal parasite prevention and treatment program aims to improve the health of these students – through medication, health education, access to clean water and shoes, and improved sanitation. Life in Papoga can look laborious and demanding to those of us on the outside. Indeed part of our job is to look at the state of their health in such a setting and find ways to improve it. However, beyond all else, the setting and the people within it remain shockingly beautiful. This is what struck us the most during our time with Kevin and her family and friends: the beauty. The most effective health professionals can see beauty in even the most broken bodies. They see potential in the poverty-stricken and light in the darkness. Where they see suffering, they also see a joy that only those who have truly suffered can know. Kevin knows joy. It’s not our job to introduce it to her. Our job is to work with students like Kevin to compound joy with health, so that the beauty that exists can last. Every morning, 12-year-old Kevin rises promptly with the sun to do her chores before going to school. She sweeps around the hut she shares with her sisters, gathers water from the nearby source, and washes the previous night’s dishes. After putting on her uniform, she walks to school, where she joins her friends and resumes her studies. Her favorite class, she says, is English. This is where she and her classmates encounter International Medical Outreach when the team is on the ground in Papoga, Uganda. In Kevin’s community, IMO’s intestinal parasite prevention and treatment program aims to improve the health of these students – through medication, health education, access to clean water and shoes, and improved sanitation. Life in Papoga is beautiful, albeit laborious and demanding. The perspective we gain from students like Kevin shows us first of all that we live utterly different lives. We appreciate that difference and, therefore, seek only a way in which our program will fit into the unique life of the community. In many of the areas in which we work, we have met people who depend on water sources that are contaminated with harmful pathogens and bacteria. If available at all, clean water may be limited or difficult to obtain. 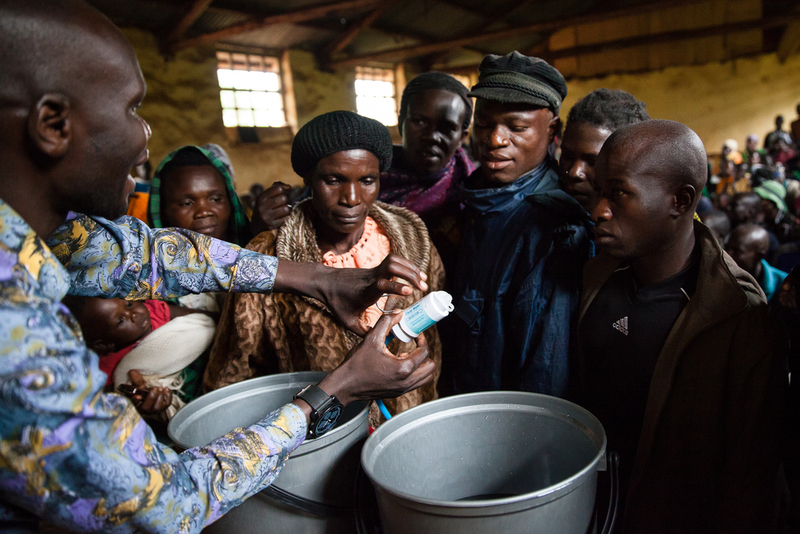 On a recent trip to northwest Uganda, we introduced headteachers and community leaders to the idea of using a water purification system given to us by a friend. 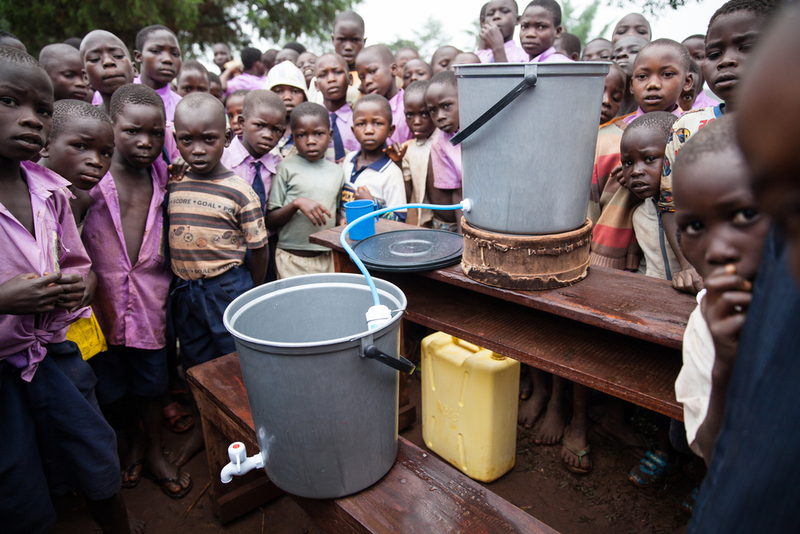 We set up a filter at each of the four primary schools in Papoga, Zombo District to supplement our program in teaching hand washing and healthy sanitation practices. With simple maintenance, these filters can purify up to 150 gallons of clean, safe drinking water each day for up to 10 years. In July 2013, the 86 boarded girls at Bethel Junior School in Zombo, Uganda, received beds through the generous donation of IMO's many partners and supporters. Their dormitory is now furnished with locally manufactured bunk beds and a mattress, blanket and mosquito net for each boarded girl. A report from Bethel states that the beds have not only led to the girls' academic improvement and general health but also increased female enrollment and pursuit of high school admission. Unlike at many other schools in the district, the gender ratio at Bethel Junior School has become more level in previous years. The overall success of this program has encouraged us to do the same for the 70 boys at Bethel. The 35 bunk bed frames have been constructed and delivered to the school. Mattresses, blankets and mosquito nets have yet to be purchased. To help us reach our goal for the upcoming school year, visit this project's page and follow the prompts to offer support. Edit: Thanks to our many generous supporters, this project has been fully funded.